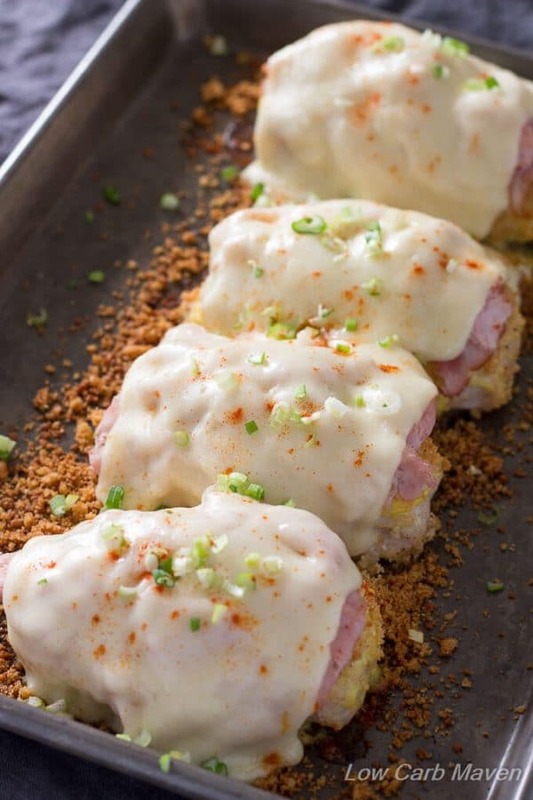 This Malibu Chicken recipe is an easy weeknight meal of boneless skinless chicken breast, low carb keto breadcrumbs, deli ham, and Swiss cheese. 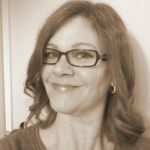 A few months ago I saw a recipe for Malibu Chicken on my friend Stacey’s blog Beauty and the Foodie. I had never heard of Malibu Chicken before and decided to do a google search. Here is what I found out. Malibu Chicken is a dish made famous by the Sizzler Steak House and consists of breaded chicken, ham, and cheese baked in the oven. There are many a copycat recipe for Malibu chicken online and they are all very similar. I even saw a YouTube clip of the original 1970’s television advertisement for Malibu chicken. The announcer described a breaded chicken patty topped with ham and cheese served with a mustard dipping sauce and a steak. Honestly, the dish looks ghastly in the commercial. One can find the most popular recipe for Malibu chicken on Chef in Training. Nikki states that her mother worked for Sizzler Steak House and shared the recipe with her. I looked at her recipe and thought it sounded wonderful, but I knew I could make it easier and low carb, gluten free, and even keto. I’ve made this recipe at least 10 times in the past few months and it’s always great. Since the original recipe for Malibu chicken calls for a mustard dipping sauce and a separate sauce in which to marinate the chicken, combining them into one and dividing use is the easiest solution. And instead of coating the chicken in breadcrumbs, I chose the low carb breadcrumb option of crushed pork rinds and Parmesan cheese. 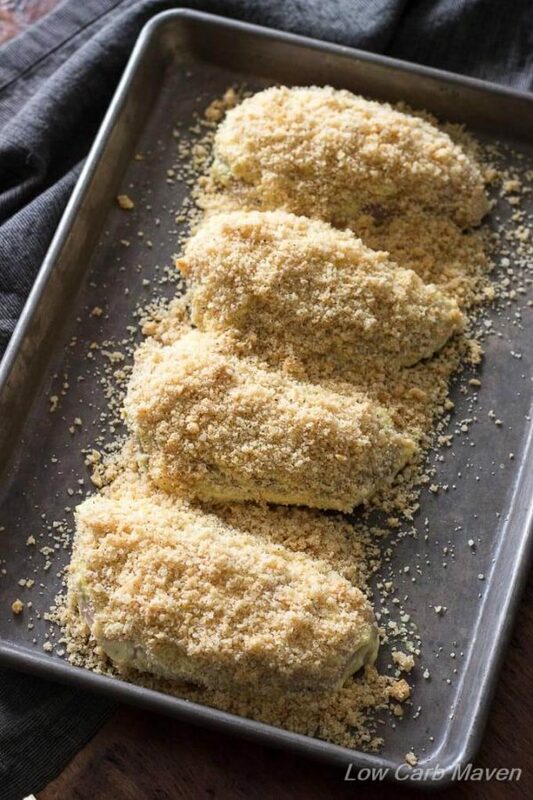 I’ve even eliminated the step of coating the chicken in the low carb seasoned bread crumbs recipe to save time and work. Some of you may be of the opinion that baked chicken breasts are dry. This recipe for Malibu chicken is moist every time. I do, however, buy a better quality chicken. It is not organic, but it is free of antibiotics and hormones, and air chilled instead of flash frozen. The breasts are more modest in size and after removing the “tender”, each breast is five to six ounces in weight. I’m of the opinion that 4 chicken breasts is enough for 4-6 people and my family of 4 always has some left over. This Easy Malibu Chicken Recipe is 4 net carbs per serving. Preparation: Preheat the oven to 350 degrees and place rack into the middle position. Finely crush the pork rinds in a food processor or place them in a bag and bash them with a mallet or rolling pin. Ready a 9 x 13 inch glass baking dish or a 1/4 size sheet pan for the chicken. Method: Put the chicken on a plate and pat dry. Season with salt and pepper. Mix the mayonnaise, mustard and sweetener in a bowl. Add 1/4 cup of the mustard mixture to the plate with the chicken, reserving the rest of the mixture as the dipping sauce. Roll the chicken in the mixture with a fork, right there on the plate. (Alternately, the chicken can be placed in a bag or in a bowl and mixed with the mustard mixture and marinated.) The chicken can be cooked right away or marinated for up to 1 day. Mix crushed pork rinds, Parmesan cheese and seasonings together. Sprinkle 1/2 of the crumb mixture in the baking dish or sheet pan where the chicken will be placed. Place the chicken on top of the crumbs. Add the other half of the crumb mixture over the chicken breasts. This sounds sooooo good,and I was just looking for a little variety on my Atkins.I cant wait to try it ! Well that was easy, and so delicious. I’ll definitely make it again. Thanks for the recipe Kim! Do you think a skinless Turkey Breast would work for this recipe? I’ve got some I need to use up. I made this recipe last night and was really surprised at how flavorful it was. This recipe will be at the top of list. Looks delicious! Do you have a preferred brand of pork rinds? Hi Kim, what kind of parmesan did/do you use in this recipe: freshly grated, or shelf-stable? Thank you! Ah, got it. I used shelf-stable parmesan, and my chicken didn’t turn out very crispy. It was very tasty though, and we enjoyed it first with roasted garlic smashed cauliflower, and later atop a bed of lettuce, parsley, and scallions with the dipping sauce thinned out for dressing. My husband thought it was excellent, so I’ll definitely make it again, and I’ll use “the good stuff.” =) Thanks for the recipe! This is so delicious and super easy to make. I have made it several times now. I just love that sauce too. I now keep a jar of it in the fridge. I love it with tuna and as a dip for bunless cheeseburgers. This is delicious and comes together very easily. This is going into our regular rotation. My husband loved the dipping sauce and thought it took it to the next level. I served with green beans and it was a perfect meal. Soooo, I tried this recipe tonight. Omg, so delicious! However, I thought I had some ham, but I did not. I was so bummed, cuz my taste buds were set! I looked through my freezer, and found some European Cottage bacon. This bacon is good stuff (does not taste like bacon, but like smoked ham), so I thought, why not! I’m so glad I did because it was absolutely devine and my husband loved it! The chicken was so moist and juicy, as you stated. I definitely will be baking this again! Thank you so much for an easy and delicious keto chicken recipe! 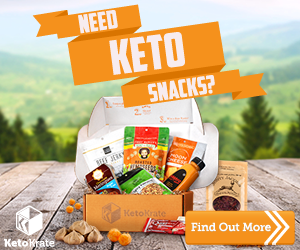 This was the best Keto recipe I’ve tried by far! the chicken was very juicy & my kids asked for seconds! Definitely will be a weekly dinner, Thank you for posting. Just made this, it was awesome. I used bacon instead of ham and mozerella instead of swiss, and brown sugar instead of powdered, but the results were amazing. Will make it again for sure. This was incredibly good. We were tempted to lick the plates clean! That crumb topping was so tasty. I might try it on cauliflower cheese the next time we have it. Thanks as always for another outstanding recipe! I think I would be lost without your site now! We’ve been trying a new recipe every single week this year and they’ve all been incredibly good. Especially the peanut butter cookies! I’ve used those babies as one large baked cheesecake crust topped with a simple sugar-free chocolate and peanut butter no-bake chilled cheesecake filling. Everyone went crazy for it and it was demolished immediately! It was higher in carbs though, about 13g net per slice I think, but I can see myself doing it again as a tasty treat for special occasions. Hey there! 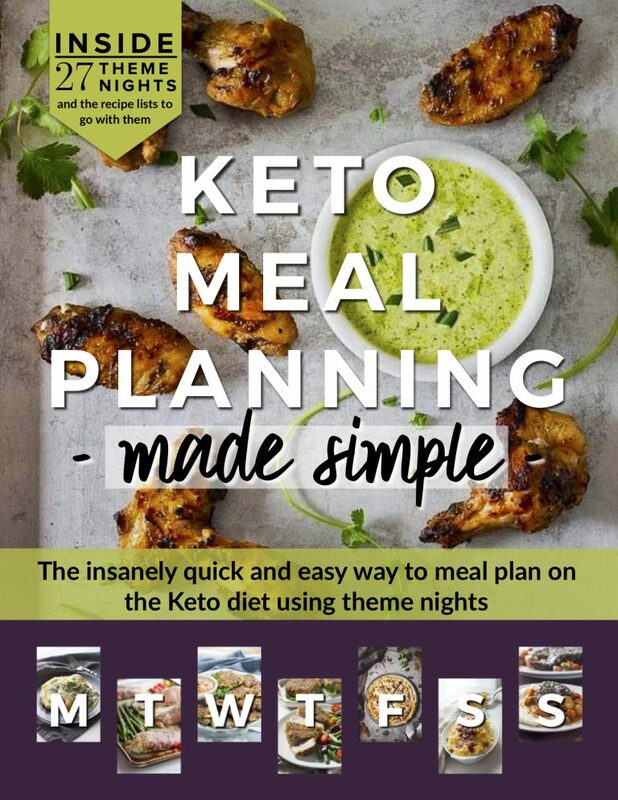 My husband and I are brand new to Keto and this looked like a great recipe to try tonight. The only question I have is on the macros. We are doing 4 chicken breasts (6 oz each) and everything else will stay the same. My question is, how do I calculate the calories? There are 3 different values listed and I’m not sure which one to go by? Is it the 696? The 495? Or the 464? I’ve entered all the ingredients into MFP and that is giving me 635! Any help would be appreciated! Thank you! Remember, too, that every body metabolizes food calories differently, so the caloric measurements of food really don’t matter in the long run. Just make sure you’re listening to your body and giving it all the nourishment it needs, regardless of what you look like. This was really wonderful, it was a big hit with the family! I only had brown sugar substitute and it worked perfectly in the dipping sauce. This will definitely go in the rotation!! This was a delicious meal. Served with sautéed kale. Followed the recipe exactly except using sweetener in the sauce. Very easy to make as well. Thank you for sharing! Delicious! It smelled so good while baking that my 16 year old son was stalking the timer. The whole family loved it! Thanks for a great recipe. CAN I SUBSTITUE SPLENDA FOR THE POWDERED SUGAR? Kim, I don’t know you but I love you… for posting this recipe! 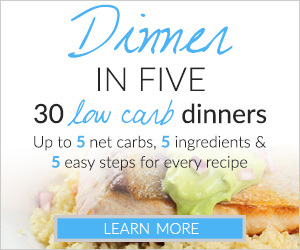 It is one of the BEST low carb recipes I have tried. I added some steamed green beans as a side, and it was an awesome meal! So glad I tried this and have it in my arsenal now! Thanks again!!! Hi Kim. Made this for supper tonight. Let’s not mince words here…KILLER recipe! Thank you! First time in my life I’ve had pork rinds, too. Talk about DELISH! 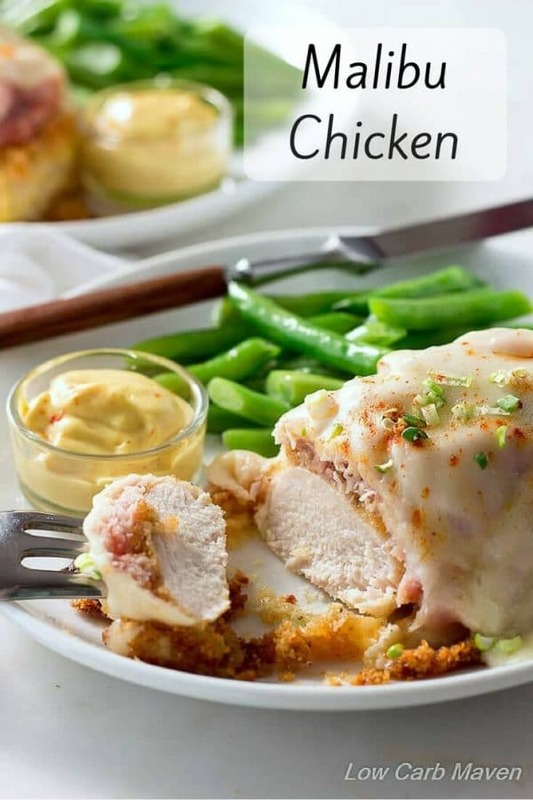 This looks so flavorful and such a fun way to dress up a plain chicken breast. Gotta try this one soon! Food safety issue – keeping the sauce you just dipped raw chicken in for dipping is very dangerous. I recommend making more dipping sauce totally separate from the coating. So sorry I missed your mention to separate out a 1/4 cup first! Kim, I made this for dinner last night and I have to say it is delicious. It was very easy to make, smelled wonderful cooking and was an easy clean up. Thank you for the recipe.